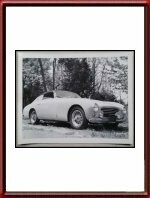 Vintage 1952 Photo of Ferrari 166 Inter Vignale Coupe S/N 0065S. 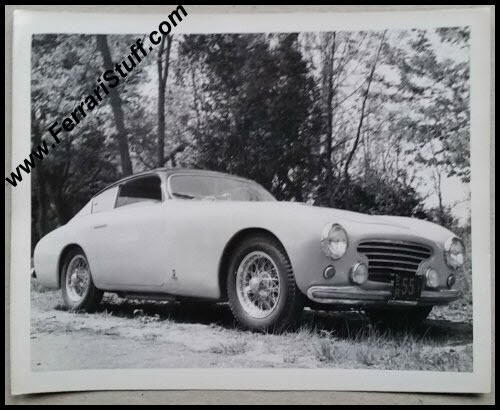 This is a vintage photo of Ferrari 166 Inter Vignale Coupe after it had been exported to the USA in 1952. The car can be seen wearing a 1952 New Jersey license plate which is somewhat contradictory to the "official history" of the car which lists it as having been exported to Florida. The car had previously been entered in the 1951 Mille Miglia, which it didn't finish, and although it appears to be in pretty good nick on the photo, closer inspection shows it to be somewhat battered. Nowadays the cars seems to be residing in Italy again. The photo measures some 12.5 x 10.5 cm (or 5 x 4 inches) and is in more than excellent condition for its age.